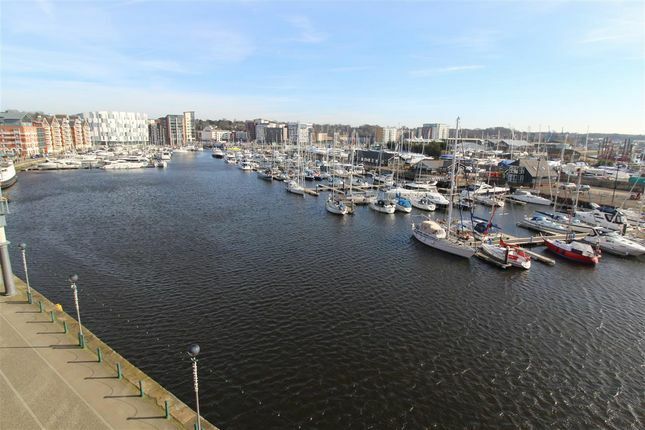 Nicholas Estates Rentals department are delighted to offer this Truly stunning and rarely available fully furnished Penthouse Apartment with full Marina views and beyond. The apartment is in excellent condition throughout with original features from the building retained with exposed brickwork and beams. The main bedroom is on the separated mezzanine level with a Private Balcony overlooking the marina with south facing aspect. The 2nd bedroom has views across towards town. There is a balcony off the living area. There is a secure parking area on a stack system with an allocated space. To appreciate this stunning apartment we recommend an internal viewing. The apartment is situated close to the hub of the waterfront with its bars and restaurants and is also situated within walking distance to the Railway station. Secure front entrance into lobby and lift takes you to the top floor where the apartment is situated and to the front door and into the Entrance Hallway. There is an electric heater, recessed lights, Built in airing cupboard with hot water tank, storage and shelving. 2 Double glazed windows to front with a further high positioned window with views looking across back towards town. Maximum ceiling height of 3.2m (10ft6") Electric heater and door to En Suite with Shower cubicle and shower, low level wc, wash basin, heated towel rad, tiled floor and display shelf. Bath with shower attachment, low level wc, wash basin, heated towel rad, tiled floor and display shelf. Double glazed door takes you out onto the Balcony which has the stunning views of the marina and beyond. Exposed brickwork, Electric heaters, Further Double glazed window overlooking the waterfront. Spiral staircase takes you to the bedroom on the mezzanine level. Modern fitted units with display lighting under, Solid granite work tops Break bar, Sink unit, Integrated Electric Oven, Hob and Extractor. Integrated Fridge and Freezer, Built in Dishwasher, Tiled floor. The lights in the kitchen can be remotely controlled. Double glazed door takes you out on to the balcony with amazing far reaching views across the waterfront and towards the Orwell bridge. 2 Velux windows to the side. Exposed brick, The study area is the other end of the mezzanine area and has doors to : Walk in Cupboard with ample storage. Further storage can be accessed in the eaves area. There is a car space in the secure allocated parking area which uses a stacker system. Property descriptions and related information displayed on this page, with the exclusion of Running Costs data, are marketing materials provided by Nicholas Estates, and do not constitute property particulars. Please contact Nicholas Estates for full details and further information. The Running Costs data displayed on this page are provided by PrimeLocation to give an indication of potential running costs based on various data sources. PrimeLocation does not warrant or accept any responsibility for the accuracy or completeness of the property descriptions, related information or Running Costs data provided here.